Plans are underway for the 2016 Assembly of the Local Organic Food Co-ops Network (LOFC) - the 7th in a legacy of great networking and learning events. Workshop, speaker and plenary brainstorming has come up with some great topic areas and speakers. Registration will be available on the LOFC website in the New Year and there is still time to offer contributions to the program and for additional volunteers. A sponsorship package is also available. Contact LOFC Network Communication and Event Coordinator: Joan Brady at 519-237-3108 or lofcnetwork at gmail.com. The Assembly will be preceded by a focused finance day (February 22, at Ignatius, Guelph) that is being organized in collaboration with the Ecological Farmers Association of Ontario. Entitled Fair Financing for Local Food and Farms, the various workshops and plenaries will explore innovative and adaptable forms of finance. Conversations with lenders and funders will explore various financing sources and how to build meaningful dialogue. The day will also begin to build the case for sector benchmarking and creating the narrative necessary to prove the economic impact of food systems across Ontario. 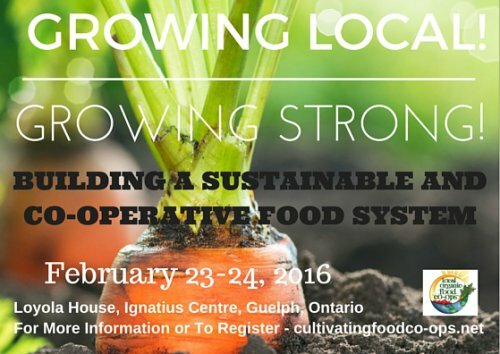 Registration for this event will be on the EFAO website and available in the new year. It will cost $75 to attend and accommodation arrangements can be made for those staying to attend the LOFC Assembly.